Tickets are still onsale for the Sunday (Saturday sells out quickly) or 2-day weekend tickets. If you think they look expensive, bear in mind the central location, free (very decent) lunch and pudding, massive number of whiskies you can sample (589 listed so far with many exhibitors bringing more) over 7 hours plus a token for a dream dram with more available to buy when you’re there. Using these, it’d cost you £40 for a dram of Auchentoshan 1966 (which would be £114 for 2cl if you bought the bottle), or you could use your included token for a dram of this ‘80s Springbank 21yo, which would cost you £22 if you bought the whole bottle. Also, remember that it is AWESOME. If you’ve not been before, have a look at the site, my report from last year’s show (note that the first picture shows an almost empty show right at the start of one of the days, it’s pretty busy an hour in), maybe check the list of whiskies you can sample and goggle at the list of Dream Drams. What else is on? Food pairing with whisky (last year there was posh chocolates, cheese, and even music with whiskies), masterclasses (but you’re too late for the Laphroaig one) and first access to a few show bottlings (although this doesn’t mention some for-some-reason-not-mentioned stuff like a TWE exclusive Arran Private Cask). 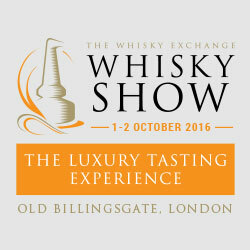 There’s also loads of other whisky that’ll be launched at the show, including the two enormously exciting Compass Box whiskies “This is not a luxury Whisky” and the “Flaming Heart” 15th anniversary. And a ton of other new things that make their debut at the ‘show. I shall report back, hope to see you there!